Habitat: Desert (upper elevation), Upland. 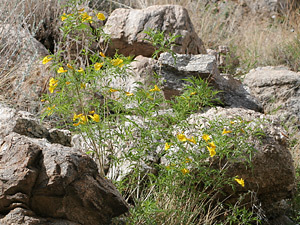 Yellow Trumpetbush grows on rocky hillsides and is typically found in the lower mountain foothills. This plant is frost sensitive, so it prefers warm locations like sunny, south-facing hillsides where the cold winter air drains away at night. Because it has showy flowers and attractive foliage, this plant is also grown as a garden and landscaping plant here. Description: The trumpet-shaped flowers are clustered at the branch tips. 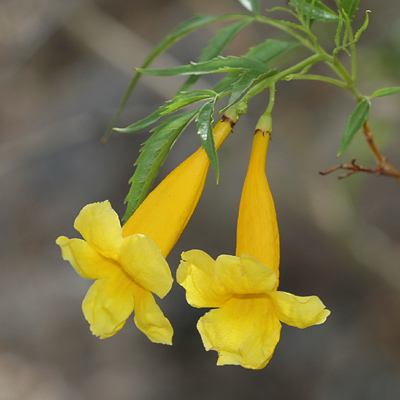 The individual flowers are broadly tubular, 2 inches (5 cm) long, and have 5 rounded lobes. The flowers are followed by 8 inch (20 cm) long, narrow, brown seed pods. The leaves are pinnately compound with an odd number of green, toothed, lanceolate leaflets. Hummingbird Flower – The flowers attract hummingbirds and also large, black Carpenter Bees (Carpenter bees (Xylocopa spp. ).